There were three generations of “Mary Janes” in her family; her maternal grandmother, Mary Jane Boyd Bell; her mother, Mary Jane Bell Spence, and Jane–Mary Jane Spence! Young Jane followed the same tradition as her mother: they were both known by their middle names. She grew up in the Elisha Spence household and watched the older children disappear. She knew Samuel, Daniel and Milly Catherine but since Levi and William spent so many years in North Carolina, she wasn’t all that familiar with them. Apparently, she was a companion of the two Rhodas while they were still at home. And there was another reason for her choice of Williamson County, Tennessee–a man by the name of James Garrett, who was had been living in the area for a while, and who was a friend of her family. Finding James Garrett was no easy matter! I thought it would be a simple job. But the only two documents I have for him are the marriage document referenced above and the 1850 Census for Haywood County, Tennessee. I could have made this a really simple story by introducing those two documents followed by a conclusion–two paragraphs at most. However, my sense of “shoveling” and “digging” prevailed, and I started doing just that. The 1850 Census notes that James Garrett was born in North Carolina in 1804, and that he was living with his wife and children in Haywood County, Tennessee. The more I dug, the more Garretts I spaded up. And the more Garrets I spaded up, the deeper I had to dig. What was so special about Haywood County? I wondered. Haywood County was created from part of Madison County in 1823–24, and was named for Tennessee judge and historian John Haywood. Haywood County was part of Madison County when the Tennessee General Assembly created it in 1823–24. (Later, portions of Haywood would be carved out to create Lauderdale and Crockett Counties.) The legislature designated Brownsville as the county seat. Farming, especially of cotton, was the basis for the local economy for much of its history. Until the Civil War, this meant a plantation system dependent upon slave labor; after the war, tenant farmers and sharecroppers took the place of actual slavery(8). The reference to Madison County did not escape my notice. Shortly after the 1830 Census in Davidson County, Tennessee, the Elisha Spence family moved to Madison County. While shuffling through Haywood County records, I discovered a number of Garretts residing in Haywood County, the majority settling in District 10. And that is where James and Jane lived in 1850, I thought. Those Garretts must have been related to James, and they came from North Carolina! But from where? Samuel Garrett (1772-1858). About to be discussed. Probably by John’s first wife. Pleasant Garrett (1781-1826). Pleasant was born September 10, 1781 in North Carolina, and he died December 20, 1826 in Jefferson County, Tennessee. His wife was Margaret Peggy Brevard (1793-1876). Their children were: (a) John Garrett (b. 1810); (b) James Garrett (b. 1811); (c) John B. Campbell Garrett (1813-1891); (d) Priscilla Garrett (1814-1894); (e) William Moore Garrett (b. 1816); (f) Elizabeth Jane Garrett (b. 1820); (g) Albert Francis Marion Garrett (1822-1891); (h) Pleasant Jasper Garrett (b. 1824); (i) Margaret Jerusha Garrett, who died in 1907. Elizabeth Garrett (1784-1860). She was born in Virginia, and she died in Rockcastle, Madison, Kentucky. Her records are really confusing, so I won’t extend her line. John and Elizabeth Amonett Garrett had a daughter named Elizabeth. That is the only information I can verify. Margaret Garrett (b. 1789). I have no additional information. [Note: The family information for John Garrett and Elizabeth Amonet/Amonett comes from The Garrett Family of Craighead Co. and Greene County, Arkansas website](12). John Garrett was the son of Isaac Garrett (1719-1775) and Ann (Rux??). Isaac was the son of John Smith Garrett (1690-1743) and Susannah Featherstone Burton (b. 1695) of Amelia County, Virginia(13). Sarah Elizabeth “Sally” Garrett (1808-1851). Sally was born in Greene County, Tennessee in 1808, and she died in 1851 in Navarro, Ellis County, Texas. Her husband was Abijah Smith Gibbs (1805-1860). Their children were: (a) William Riley Gibbs (1827-1892); (b) Elisabeth Gibbs, born 1830; (c) Mary Anne Gibbs, born 1833; (d) Barbara G. Gibbs, born 1835; (e) Sarah J. Gibbs, born 1837; (f) James Patrick Gibbs (1839-1925); (g) John S. Gibbs, born 1841; (h) Martha R. Gibbs, born 1843; (I) Drucilla E. Gibbs, born 1845; (j) Lucy C. Gibbs, born 1849. Elizabeth J. Garrett (1810-1870). [Note: Elizabeth’s records are often jumbled with her sister Margaret. Jacob’s will indicates they were separate individuals]. Elizabeth was born in November 1810 in Greene County, Tennessee, and she died in 1870 in Liberty, Bollinger, Missouri. Her husband was William Youngblood (1806-1870). Their children were: (a) Alfred Mory Youngblood (1827-1864); (b) Son Youngblood (1829-1829); (c) John Garet Youngblood (1831-1890); (d) Dr. James M. Youngblood (1833-1879); (e) Martin V. Youngblood (1841-1881); (f) Barbara “Barbary” Youngblood (b. 1843); (g) Mary Magdalene Youngblood (1844-1873); (h) William O. Youngblood (1846-1903); (I) Elizabeth Youngblood (b. 1851); (j) Sarah A. Youngblood (b. 1851); (k) Emma Youngblood (b. 1853); (l) Lincoln Youngblood (b. 1854). Cemetery Description Located 9 miles southeast of Greeneville, on road connecting the John Sevier Highway and Jones Bridge roads in the 22nd Civil District of Greens County. This cemetery is on the grounds of the United Presbyterian Church at that point(14). Allen and Margaret had the following children: (a) Jacob Martin Kennedy, born 1828–who is mentioned in his grandfather’s will as Jacob Kennedy; (b) John Wesley Kennedy (1831-1896); and (c) Martha Kennedy (1833-1850). John Garrett (1813-bef 1838). John was born in 1813 in Greene County, Tennessee, and he died before 1838 in Greene County. His wife’s name is unknown, but they had a son named William Jacob Garrett, who was born before 1838 in Greene County, Tennessee, and who is mentioned in his grandfather’s will as William Jacob Garrett. Magdelene Garrett (1815-aft 1838). Magdelene was born in Greene County, Tennessee, and she died after 1838 in Greene County, Tennessee. I have no additional information about her. She is named in her father’s will. Some people think Jacob had a second marriage–that he married Barbara Jack in 1805 (which he did), and that he married a Rachel Stone in Madison County, Kentucky in 1806 (which he did not). That was a different Jacob Garrett. This Jacob had only one wife–Barbara Jack. She was the mother of all of his children, and she was still alive when he died in 1838, according to his will. He settled in Greene County, Tennessee, and he stayed there! His will does not mention the oldest surviving twin, James Garrett (b. 1806), but James was placed in the Samuel Garrett household as an infant where he bonded with Samuel’s family. It is doubtful that there was any relationship between James and his real parents. James grew up presuming that Samuel and Elizabeth were his real parents and that he was born in Person County, North Carolina. It didn’t bother him that one brother had the name of James. People often used the same name in the same generation; the second James was James B. Garrett. I have yet to discover James Garret’s middle name, although it may have been Harvey since his son was given that name: James Harvey Garrett. Parthenia Garrett (1799-1840). Parthenia was born in Person County, North Carolina about 1799, and she died in Giles County, Tennessee in 1840. On June 22, 1820, she married John Alfrod Tillman (1790-1855) in Giles County, Tennessee(10). Their children were: (a) Harriet Tilman, born 1822; (b) William Turner Tillman (1822-1892); (c) John Alexander Tillman (1825-1884); (d) James Henderson Tillman (1827-1884); (e) George Washington Tillman (1829-1919)(17). Addison Broughton Garrett (1800-1874). Addison was born in Person County, North Carolina about 1800, and he died in 1874 in Giles County, Tennessee. His records are sometimes confused with his brother, James B. Garrett, who, as already mentioned, is not the James Garrett under discussion here. His wife was Elizabeth McKay (1800-1850), whom he married about 1815. Their children were: (a) James Garrett (1815-1855)–not the James Garrett under discussion here either; (b) Mary Ann Garrett (1825-1878); (c) Henry S. Garrett (1827-1875); (d) Elizabeth B. Garrett (1831-1866); (e) John Thomas Garrett (1833-1878); (f) Nancy Garrett (1836-1878); (g) Isham Stephens Garrett (1838-1863); (h) Abegale Garrett (1843-1926); (I) Ethlinda Ann Garrett (1848-1878)(18). Addison appears to have had two additional marriages: Martha Keath on October 24, 1856 in Giles County, Tennessee, and Mary Gordon on March 14, 1865 in Giles County, Tennessee(19). James B. Garrett (1802-1891). James was born October 6, 1802 in Person County, North Carolina, and he died September 4, 1891 in Lauderdale County, Tennessee. His wife was Harriet Tilman (b. 1823). Their children were: (a) Martha Ann Garrett (1848-1889); (b) John Jackson Garrett (1851-1931); (c) Elizabeth Phoebe Garrett (b. 1853); (d) Samuel Garrett (b. 1860); (e) Nancy J. Garrett (b. 1861). As noted, he is not the James Garrett under discussion here and is the other brother with the same first name. By 1836, he appears on the tax records for Haywood County, Tennessee(20). By 1850, he was back in Giles County(21). By 1880, he relocated to Lauderdale County, Tennessee, where he appears on the Census(22). James B. Garrett died September 4, 1891 in Lauderdale County, Tennessee, and he is buried in the Crossroads Cemetery, Ripley, Lauderdale County, Tennessee(23). Phoebe (Phebe) Garrett (1815-bef. 1860). Phoebe Garrett was born about 1815 in Person County, North Carolina, and she died before 1860 in Haywood County, Tennessee. She appears to have never married and was living with her parents in Giles County in 1850(29). Her parents both died in 1858. After her parents’ deaths, she moved to Haywood County, Tennessee, where other relatives were living. Nancy Garrett (1817-1858). Nancy was born in Person County, North Carolina in 1817, and she died in Giles County, Tennessee in 1858. She does not appear on the 1850 Census in the Samuel Garrett household(29). I do not know whether she married or remained single. Samuel’s wife was Mary McColpin (1836-1897). Their children were: (a) Monroe Garrett (b. 1862); (b) Alva Garrett (b. 1864); (c) Alra R. Garrett (1864-1906); (d) Ira Garrett (b. 1866); (e) Henderson Garrett (b. 1869); (f) Lutita Garrett (b. 1872); (g) Bera Garrett (b. 1875). Elizabeth A. Garrett (1828-1858). Elizabeth was born in 1828 in Giles County, Tennessee, and she died in 1858 in Giles County. While her name appears on an accepted list of Samuel and Elizabeth’s children, I can’t help but think she was a grandchild. If her date of birth is correct, Samuel would have been seventy-eight, and Elizabeth would have been seventy-two. Likewise, a young woman named Timmantha Garrett (b. 1838) appears on the same 1850 Census in Samuel’s household(31). Timmantha disappears from the records while many people believe Elizabeth lived until 1858. Then Elizabeth disappears from the records. Unless the dates of birth are wrong, these two women were probably grandchildren. Perhaps Samuel and Elizabeth took in a number of orphaned children from the various Garrett families over the years. And so it seemed only natural for James Garrett to accompany the Samuel Garrett family from Person County, North Carolina to Giles County, Tennessee. The move to Tennessee occurred around 1818 when James was twelve years old. Giles County sounded like an interesting place. James was eager for excitement. Giles County is named after William Branch Giles, a Senator from Virginia who sponsored the admission of Tennessee as the sixteenth state into the Union. He also sponsored the building of the city and courthouse, which has burned four times. The current courthouse was built in 1859 by the George Moore and Sons company. It cost about thirty thousand dollars to complete. 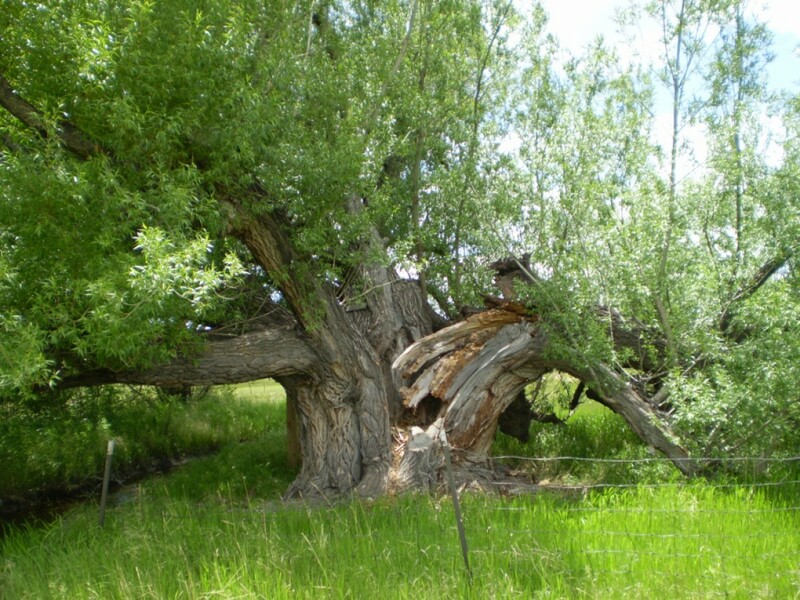 Though it stood through the Civil War, it suffered much damage. One of Giles County’s local heroes is James McCallum, who served as Grandmaster of the Tennessee Masons, a member of the Confederate Congress, and mayor. He lived in Giles County for seventy years. The reference to Williamson County quickly caught my attention. Many of my Spence and related families lived in the area. Samuel Garrett often traveled to Williamson on business, as well as to Davidson County. Young James no doubt accompanied him. And it was on one such excursion where Samuel Garrett met Elisha Spence, and young James soon met the rest of the family. The two families often got together. James Garrett and Mary Jane Spence probably knew one another for some time before “romantic sparks” began to fly between them. Then in 1830, the Elisha Spence family moved to Madison County. “If you go over there, let me know. I’d like to tag along!” James told Samuel one day. “Hmmm! I wonder why!” Samuel Smiled. Elisha died in 1835. His family moved from Madison to Marshall County. And by 1836, James B. Garrett appeared on the tax records for Haywood County. James accompanied him whenever he went over there, stopping by Marshall to see Jane. Then Jane’s mother died in early 1842. After the funeral, she told James she was moving to Williamson County where two of her sisters and her brother lived. James and Jane were married September 21, 1842 in Williamson County. By then, a number of the Garrett brothers were moving to Haywood County. James and Jane would move there as well. They had two children who appear to be twins: Harvey and Sarah, born in 1844. They last appear on the 1850 Census for Haywood County in District 10(33). James was a farmer, although I’ve read some glorious accounts focused upon who he may have been. Those accounts also include his wife Jane. She bears the McDearmon surname in some accounts, even though people making that claim use the 1842 marriage record clearly showing her surname as SPENCE. Mary Jane Spence was NEVER a McDearmon–probably the reason why I spent so much time working on this article during the week! One wild story connects James Garrett with a Rev. James Garrett, a minister in the Anglican Church, who spent years preaching in Tasmania. (James and Jane were Baptists, Methodists, or Presbyterians, and they stayed in Tennessee). That same story connects the daughter Sarah with two marriages: one to a Jones in Eastern Tennessee, and the other to someone in Australia where they had a number of children. Those Garretts did exist in Australia, but they were not James Garrett (1806-1860), Mary Jane Spence (1813-1860) or their children Harvey and Sarah! All four members of my James Garrett family disappear in Haywood County, Tennessee before the 1860 Census. When you stop and think about it–I decided–a number of people disappeared in Haywood County around 1860! While James Garrett, Jane Spence and the children disappear before 1860, the 1860 Mortality Chart for Haywood County, Tennessee lists pneumonia as the cause of numerous deaths that year in District 10(34). The Garretts may have died of pneumonia. Those farms were all close together and family members frequently interacted with one another. The Garretts may have even died in the early 1850s. Isom Rainey died in 1853. He and his wife were in District 10 in 1850. Neither James nor Jane nor their children appear on any 1860 Census that I have studied! I don’t know where this family is buried. A number of the Garretts and their relatives are buried in Crossroads Cemetery, Ripley, Lauderdale, Tennessee, so I suspect these Garretts are buried there as well. Many graves are unmarked. As I recall, over 200 people are buried in Crossroads. One thing I definitely know is this: James Garrett (1806-1860), Mary Jane Spence (1813-1860) or their children certainly aren’t buried in Tasmania! 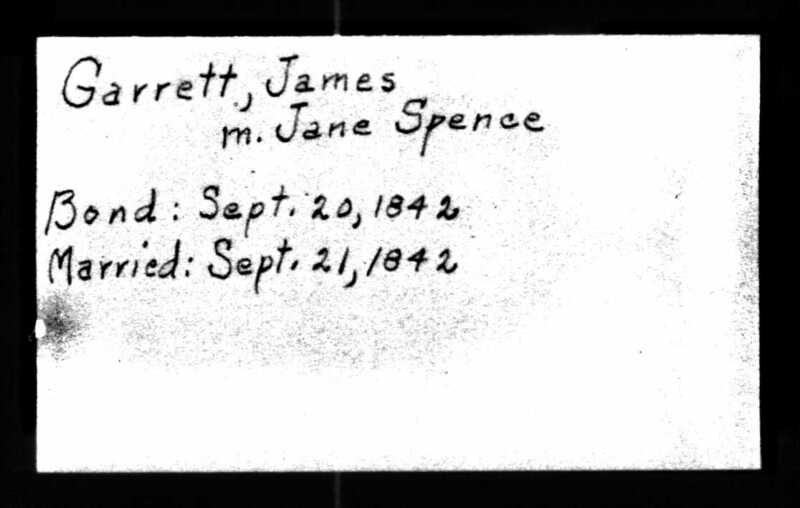 (1) Official Copy of James Garrett and Mary Jane Spence Marriage Record. Bond posted: 20 Sep 1842. Marriage: 21 Sep 1842, Williamson County, Tennessee. Obtained from the Tennessee State Library & Archives, Nashville, Tennessee. (5) Elisha Spence Estate Inventory, dated November 1835, Madison County, Tennessee. Listed on the records as “Li Spens.” Official copy obtained from the Tennessee State Library & Archives, Nashville, Tennessee. (16) Virginia Marriage Records, 1700-1850 about Samuel Garrett and Elizabeth Broughton. Ancestry.com, Provo, Utah. Date Accessed: 26 Sep 2015. Available online at http://www.ancestry.com. I was thrilled to find my gg grandmother Priscilla Garrett Gray included in your work. Found that my ggrandfather Pleasant Jasper Gray’s name came from her brother. I’m interested in making my ancesters more human. Learning little things about there daily lives is a gift. If pictures of anyone I might include in my generic line exist I would be grateful for your sharing them. Should also say if any of Priscilla’s Gray family members contact you feel free to extend my name and E address. I’m so glad you enjoyed the article. I’ll have to check into the pictures. I don’t have the older original pictures from my mother’s Spence line. But I’ll have to go into my tree to see what copies I have been able to obtain. Our son passed away recently, so I haven’t been doing a lot of genealogy lately.